It is on the water with a spectacular water view! Thanks to some smart folks with the foresight to buy the land across the river and turn it into a park it will always remain that way. The grounds are gorgeous and expansive. Keep in mind that in my dream life I can well afford to have someone else maintain the many acres of grass, flowers and trees. The home has incredible architectural details both inside. Yesterday my son and I went on the ‘National Treasure’ tour. 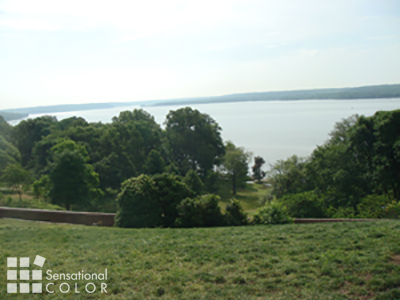 We got the inside scoop on when, where and how the scenes from the movie were set up and shot at Mount Vernon. 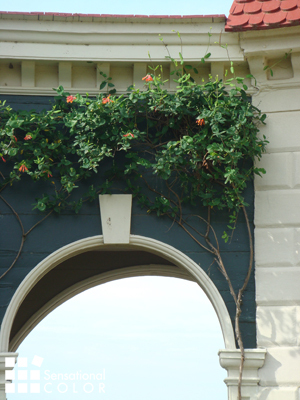 It was great fun and on this particular tour you get access to parts of the estate that you wouldn’t ordinarily get to see. I especially liked being able to walk along the water directly below the house since this is usually off limits to visitors. At the end of the tour our guide dropped us off at the mansion and since I haven’t gone through the home in a long time we decided to tag along on the tour. Okay well I try to keep Sunday as a non-work day but I couldn’t help but get absorbed by the room colors. As was the fashion of the day some of the rooms are painted in deep, bright colors, which were considered a status symbol during that period. Two rooms that especially drew me in were the dining areas. 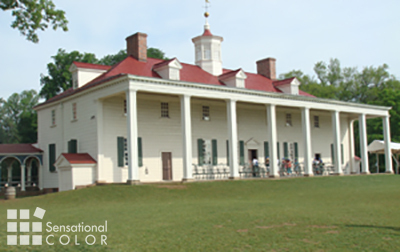 The large dining room is painted in a hue that on the Mount Vernon website is described as– “the stunning green color was a favorite of Washington’s”. 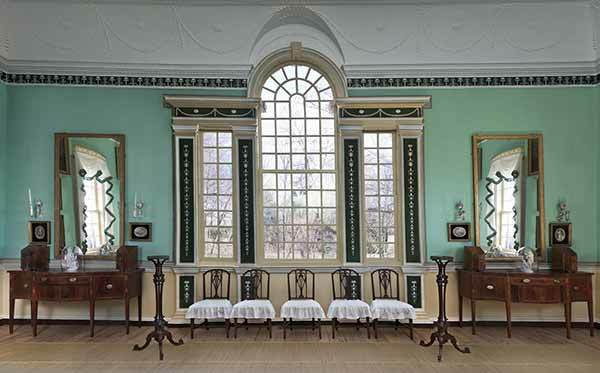 I had actually forgotten that George Washington’s loved the color green and that he had used it in both the large and small dining rooms in the home. 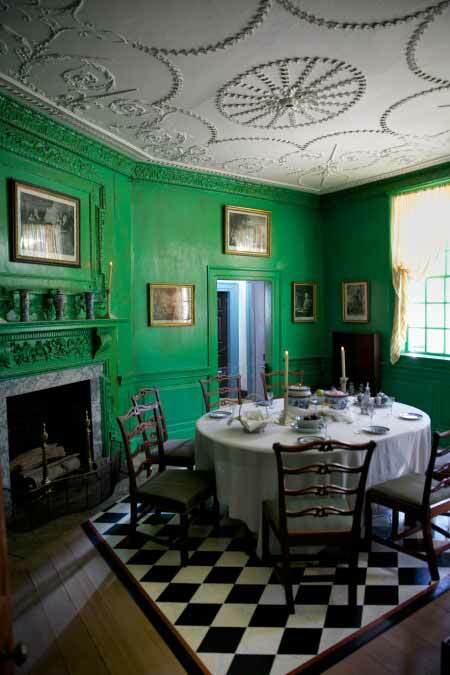 The color in the smaller dining room is much more vibrant –“In 1785, the striking verdigris green paint was added.” The guide shared that President Washington was not only fond of this color but believed it was easy on the eye and the best color to aid in digestion. I’ll let you be the judge of that but how interesting to learn that our founding father thought about the psychological and physiological effects of color. 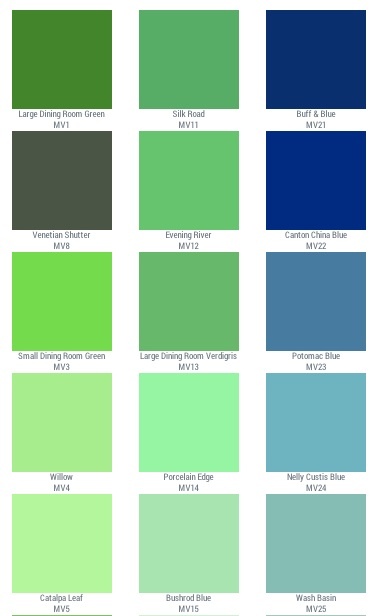 If you want to recreate these historic colors in your own home you are in luck. 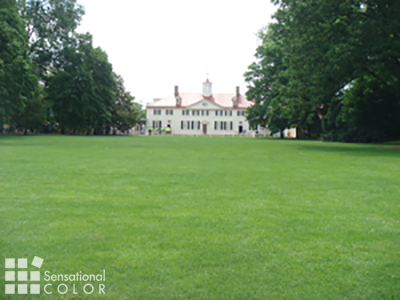 In 2003, the Mount Vernon Ladies’ Association granted the exclusive rights to manufacture paint in the historic colors of Mount Vernon to Duron Paints a division of Shewin-Williams. The palette named Estate of Colours™ includes nearly 30 colors exactly as they appear in the mansion and 90 more inspired by the 500-acre plantation and period artifacts. Are you a fan of historic homes? Do you have any favorites that have inspired the color schemes in your own home? People with traditional homes often think they must limit themselves to conservative colors like beige or gray – but as you have so clearly shown us, historically that was not the case at all. As technology allowed the production of more vibrant color, it became very trendy. What a beautiful estate – thanks for sharing. So true, Juli. More and more we are learning that “colonial” colors may not have been dull and grayed as we once thought. Thanks for your comment.